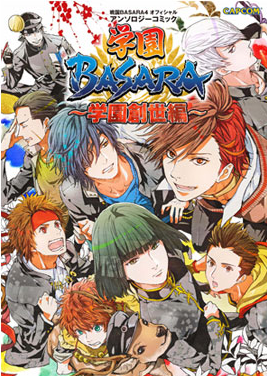 The 164-page Sengoku Basara 4 Official Anthology Comic Gakuen Basara: Gakuen Sousei-hen would have been Gakuen Basara 7 if the original numerical order had been retained. Instead of the usual volume number, the creators chose a title this time to give the long-running spin-off series a fresh start. There's a stronger sense of the overarching storyline in this volume rather than focusing on a single theme. At the same time, some older, less popular characters like the regional warlords are pushed into the background in order to make room for the seven newcomers from Sengoku Basara 4. Gakuen Sousei-hen was released back on 27th March 2014 priced at ¥980 before tax. The book can be purchased from all good import bookstores such as Yesasia, Amazon Japan (also available on Kindle) and CD Japan. Nari has drawn another beautiful wraparound cover illustration showing all of the new characters scrambling for attention next to old favourites. Inside there's a textless version as well as colour artwork by regular contributors Kyuugou and ENU. Kyuugou's shows Sakon chasing after Mitsunari with Katsuie sadly watching the Azai couple in the background, while ENU's depicts the ladies of the series together in a cookery class. The following chapter-by-chapter descriptions contain mild spoilers but I'll try not to give away any endings or jokes. There's a major shift in the balance of power when school chairman Oda Nobunaga gambles with Ashikaga Yoshiteru - and loses. After being forced to hand the school over to the eccentric man known for ruling the underworld as its 'Emperor', Nobunaga vanishes in search of Nouhime and Ranmaru. Yoshiteru wastes no time in introducing himself to the student body with a inspirational speech, triggering the usual frenzied battles and character introductions. Shibata Katsuie has been left behind as the sole representative of the Oda faction, charged with finding Yoshiteru's weaknesses in preparation for Nobunaga's eventual return. He's been trying to shadow the new chairman but it isn't long before Yoshiteru's seductive personal secretary, Maria, catches him in the act. Katsuie is forced to watch as Maria's self-centred attitude causes problems for everyone she meets. Ii Naotora is upset at how perfect the Maeda couple is when there are no decent guys around for her. Tsuruhime decides to guide the hot-tempered maiden around the school to show her that she's judged everyone too hastily. Will Naotora find anyone worthwhile amongst the eligible young men of Gakuen Basara? Yoshiteru calls Keiji, Ieyasu and Hideaki to his side to ask them about the way they view friendship. The three students each reflect on the people they care about the most, dredging up some awkward feelings along the way which soon come back to haunt them. In Nobunaga's absence, vice principle Matsunaga Hisahide is interested in discovering which of the teachers support the old chairman and which have become loyal to Yoshiteru. After gaining Kotarou's loyalty with a threat aimed at the absent Houjou-sensei, Hisahide sends the ninja out to spy on the school's staff (and a few of the students) to gauge the current state of affairs. This chapter starts with Motochika horrified to discover that someone has broken his beloved motorbike. His first suspect is - of course - Motonari, but his usual adversary denies any knowledge of the crime. Although Motochika soon gets over his loss with the support of his gang, it soon becomes apparent that someone is out to get him. What on earth has made Matabee hate this popular guy so much? Muneshige tries on the Jumbo Xavi-kun costume and ends up being mistaken for Xavi himself, sending Sourin and half of his Xavi Appreciation Society into an excited frenzy before he has a chance to explain. Can Muneshige make it out of this situation safely before things escalate further? The scene shifts to the student council (which has now been completely overrun by the growing Toyotomi army). When Sakon is sent out on an errand to fetch Hideyoshi something to eat, he ends up dragging Mitsunari and Yoshitsugu into a battle with Masamune, who needs the council's permission to rename the school baseball team. A tearful Toshiie and Matsu seek out the Detective Club to help them find the person who has stolen their precious lunch. The club's vice captain Shikanosuke (Oyassan is the actual captain) springs into action at once and begins a thorough investigation of the other students. It's a race against time to find the missing bentou before the thief has a chance to devour the evidence! Yukimura and Masamune receive poorly-written challenge letters from one another and clash in a dramatic battle. Sasuke and Kojuurou swiftly realise that the letters were written by someone else - someone who seems to want to cause trouble by fanning the flames of the hot-blooded rivalry the two boys share. Sanjou Kiiro provides another eight light-hearted 4-panel comic strips in between the chapters, and of course all seven new characters get profiles by Sanorin and Koutake Hiroyoshi explaining their designs. Perhaps we can look forward to seeing their school reports in the next volume? I particularly enjoyed the chapters from Koutake Hiroyoshi and Maki this time. The only newcomer in this volume is Konko Yukime, a regular in the Sengoku Basara doujinshi world. She turns in an excellent chapter and everyone else has previous Gakuen Basara experience so the quality of the stories is consistent. Gakuen Basara: Gakuen Sousei-hen provides the usual adorable nonsense that everyone who has been following the series this long will expect. The new characters all fit into the scenario very well and the artists don't hold back when it comes to parodying memorable scenes from Sengoku Basara 4, from character introductions to the beautiful Giga Basara ink artwork. I felt that this collection of stories flowed much better than usual - and its overarching storyline was more coherent than the plot of a comedy anthology comic with more than fifty regular characters has any right to be. It seems that the release of the latest game has given the writers a fresh source of inspiration if the happy comments at the back of the book are any indication. Roll on, Gakuen Basara 8!